Recipient of multiple awards and accolades in 2015 and 2016, MSC Divina cruise ship is a crown achievement in luxury sea travel. Designed with the timeless elegance and majesty of the Golden Age, and inspired by the glamour and elegance of award-winning actress Sophia Loren, MSC Cruises’ Divina stands out among the competition as a premiere luxury ship of their Fantasia line. With various attractions, all featuring the Divina’s unmatched luxury, you will never run out of things to do on your oceanic adventure. Marvel as you walk the steps of the dazzling Swarovski® Crystal staircases, or take time for yourself and indulge in an exotic, authentic Balinese massage in the MSC Aurea Spa. When you sail aboard the MSC Divina luxury cruise ship you can choose to eat at any of their incredible restaurants. 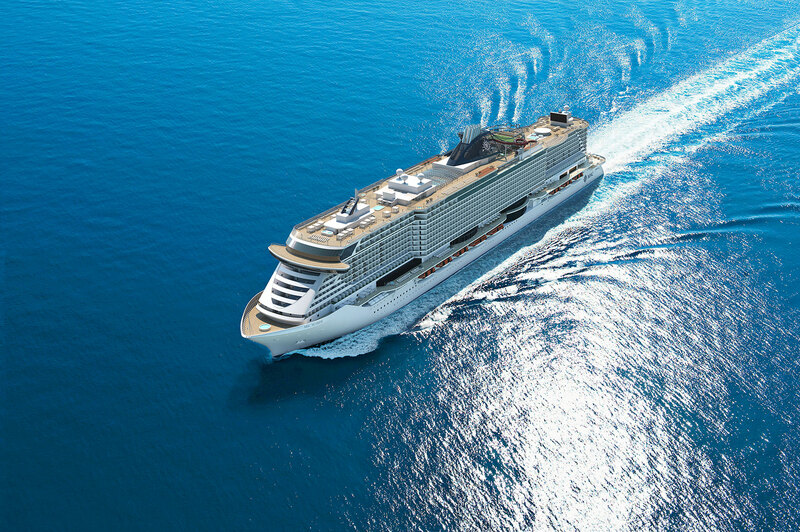 The MSC Divina and her sister ship, MSC Seaside, were designed to address your every need and at Dunhill Travel Deals, we offer incredible cruise line promotions and discounts for your trip aboard. The MSC Divina has a variety of luxurious staterooms to choose from including: well-appointed interior staterooms, adjoining staterooms for families, and the opulent MSC Yacht Club Royal Suite inspired by award-winning actress and singer Sophia Loren. Size: 151 - 301 sq. ft. Occupancy: Sleeps up to 4 guests. Queen bed, spacious wardrobe, bathroom with shower, and small sitting area. Two additional Pullman beds accommodate third and fourth guests. Note: Queen bed can be converted to two single beds on request. Queen bed, spacious wardrobe, bathroom with shower, and sitting area. Sitting area converts to a single sofa bed and an additional Pullman bed accommodates third and fourth guests. Note: Queen bed can be converted to two single beds on request. Size: 516 - 807 sq. ft. Occupancy: Sleeps up to 10 guests. Staterooms for Families are comprised of 2-3 connecting balcony staterooms. Each stateroom equipped with a queen bed, balcony, bathroom with shower, and sitting area. Note: Queen bed can be converted to two single beds on request. Size, layout, and furniture may vary from that shown (within the same stateroom category). Size: 172 - 269 sq. ft., plus a balcony up to 97 sq. ft.
Queen bed, spacious wardrobe, bathroom with shower, and balcony. Most staterooms include a sofa, and some sofas convert into a double bed to accommodate third and fourth guests. Note: Queen bed can be converted to two single beds on request. Size: 183 - 301 sq. ft., plus a balcony up to 172 sq. ft.
Queen bed, spacious wardrobe, bathroom with shower, a sitting area, and balcony. Some sofas convert into a double bed to accommodate third and fourth guests. Note: Queen bed can be converted to two single beds on request. Occupancy: Sleeps up to 2 guests. Queen bed, spacious wardrobe, bathroom with shower, and sitting area. Note: Queen bed can be converted to two single beds on request. Size, layout and furniture may vary from that shown (within the same stateroom category). Size: 183 - 301 sq. ft., plus a balcony up to 409 sq. ft. Size: 301 sq. ft., plus a balcony of 75 sq. ft. Occupancy: Sleeps up to 5 guests. Queen bed, large wardrobe, bathroom with bathtub, a sitting area, and private balcony with whirlpool tub. Some sofas convert into a double bed to accommodate third and fourth guests and also come with an additional Pullman bed for a fifth guest. Queen bed can be converted to two single beds on request. Size: 269 sq. ft., plus a balcony of 86 sq. ft.
Queen bed, spacious wardrobe, bathroom with a large shower, separate sitting area, and private balcony. All sitting areas include a sofa. Some sofas convert into a double sofa bed and some also contain an additional pullman bed to accommodate up to 5 guests. Size: 344 - 527 sq. ft., plus a balcony up to 226 sq. ft. Spacious suites that come with a balcony and a separate sitting area. Arrangements: 1 bedroom/1 bathroom - queen bed, double sofa bed, and Pullman bed to accommodate up to 5 guests. Size: 667 sq. ft., plus a balcony of 355 sq. ft.
Queen bed, spacious wardrobe, bathroom with a large shower, separate living room, and private balcony with whirlpool tub. Sitting area includes a sofa that converts into a double bed to accommodate third and fourth guests. From kids and adult clubs to sports and leisure activities, the MSC Divina has everything you need to make the most of your next cruise vacation. If you’re looking for exciting nightlife, enjoy delicious spirits in luxury bars and lounges sure to keep you and your friends entertained. Want the kids to enjoy their time on board and make friends? Choose from the Graffiti's Teen Club, I Puffi Kid's Club, F1 Simulator, and more. Soak up the sun on the top deck as you swim in the gleaming waters of the Aqua Park. Looking for something slower paced? Lay back and enjoy an authentic and exotic Balinese massage in the MSC Aurea Spa. Stay fit in the MSC Aurea Spa's full-service gym, then go for a refreshing swim in the Garden Pool, a top deck infinity pool. Play to win in the Casino Veneziano, or enjoy the MSC Divinia's Broadway-size Pantheon Theatre. Your options are only limited by the number of hours in the day, and with all the incredible onboard activities, you can fill your entire schedule with entertainment and fun. Aboard this award-winning luxury cruise ship known for culinary excellence, you’ll find delectable choices for breakfast, lunch, dinner, and snacks at any hour. From casual spots for a quick bite in between activities to elegant restaurants where you can wear your evening best, there won’t be a single craving you can’t satisfy. Here are the restaurants you'll find onboard. Inspired by timeless elegance, Le Muse takes you back to the golden age of Italian architecture with posh interiors decorated with gold drapes and large, intricately carved columns. If you're looking for a snack between activities, the Calumet Buffet offers a balance of self-service with delicious food items. Rosy interiors and silky linens are combined to create an atmosphere of elegance and sophistication. Soak in a panoramic view of the sea from one of their large porthole windows. Simple yet classic design with light colors and crystal-clear glass fixtures. Ristorante Italia features a menu filled with Italian classics. Luxurious entrees with enticing appetizers and delectable spirits; these are just a sliver of what you can expect at the Eataly Steakhouse. Sit back and relax as you take your pick of dozens of delicious tapas while enjoying a silky, rich glass of wine, a chilled beer, or an ice-cold cocktail. Enjoy a lavish meal highlighting seafood dishes in a dining room decorated with black, gold, and purple and featuring touches of marble throughout. Gaze out over the stunning blue horizon and enjoy sensory fusion meals and tasting menus set in the 1950's Dolce Vita style of the Galaxy Disco Restaurant.